After a thorough examination we will be able to determine where your problem lies and discuss how we can help you feel better. Even after just a few treatments, you will be amazed at how much better you feel! You will be able to move around better, have better circulation, and start to heal. Chiropractic care can really make a world of difference to you! 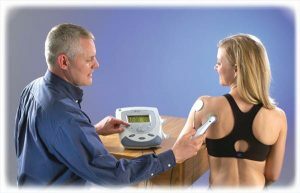 The Activator Method Chiropractic Technique is a diagnostic and treatment system used by some chiropractors to treat many types of back pain, neck pain, and headaches. 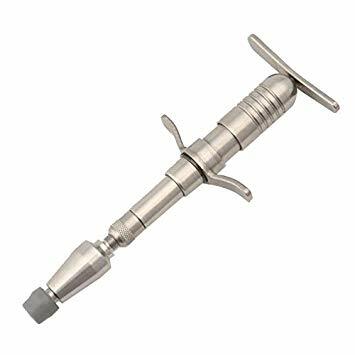 It is also very useful in the treatment of pediatric and geriatric patients along with patients who don’t respond well to manual adjustment techniques. It is an alternative to the traditional manual form of spinal manipulation, known as the diversified manipulation. There are two theoretical advantages of an instrument-assisted treatment. The first is based on the speed of the device. The instrument is so quick that the body’s muscles are less likely to tense in response and resist the treatment. The lack of muscle resistance facilitates the treatment’s effectiveness. The second is that the applied force is localized and does not add any additional torque or bending movement to the joint. Cox Flexion-Distraction is a gentle, non-force adjusting procedure that works with the body’s natural design to aid it in healing. A special, Flexion-Distraction table is used to apply the distraction adjustment. This procedure consists of ‘tractioning” (stretching) of the spine and then flexing. It relieves stress in the pelvic and sacral area and assists with muscle relaxation and proper disc space. This treatment is effective with patients who suffer from facet syndrome, spondylothesis, sprain/strain, scoliosis, transitional vertebra, sacroiliac subluxations and stenosis. This therapy is used to treat both chronic and acute pain conditions as well as to promote tissue healing and lymphatic drainage to decrease inflammation. 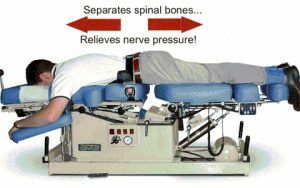 This treatment is administered by either the doctor or the chiropractic assistant and is done in 15-minute increments. It assists with myofascial pain, bursitis, carpal tunnel syndrome (CTS), scar tissue pain / wound healing, phantom limb pain and sprain/strains.